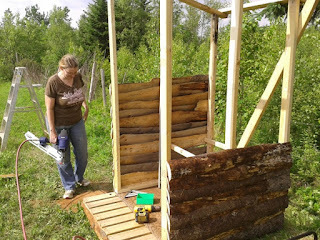 A lovely, dry day, with some welcomed cloud later in the afternoon, made perfect weather for working on outhouses again. Valonia, Ulrich, and I got a large load of first cuts from logs loaded into the truck and offloaded at the site, and placed and levelled the two bases Ulrich and I constructed last time. We then got the frames attached and finished, with Olivia joining us after her weekly stint at the local Farmer's Market. The second one went together particularly quickly, as of course after the first we were well-practised; and with the help of Mikhail's nail gun, the off-cuts, each piece custom-fitted to the sides, went up pretty quickly. We got the first one sheathed up to about shoulder height before calling it a day, having worked from a little past ten to dinner time (albeit with a break for some food and cold water in there, and a brief swim in the pond, which is lovely and warm; I'm looking forward to making good use of it during the event!). 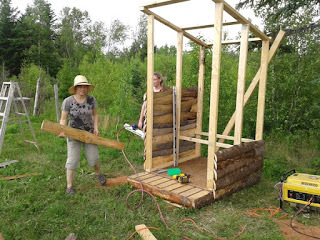 Since we had the truck right there, though, and since we were getting low on the wood siding, Ulrich, Olivia, and I did another lumber run to gather more wood so next time we can start right in on the sheathing. Hopefully we now have enough to finish them both; but we can get more if we need to. But it's time-consuming, and time is the one thing we're running out of. The kids (especially Shereen and Karl), meanwhile, helped out by working on running a bunch of older firewood that is no longer suitable for burning indoors from over by the house to out by the fire pit, in the wheelbarrow, stacking it neatly, and setting some appropriately-sized stumps around the pit for seating; and Karl dug a grey water pit next to one of the outhouses. 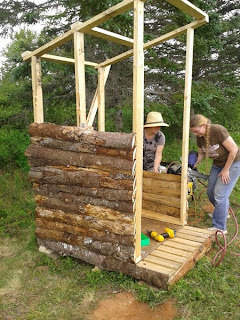 We only have one more weekend left before the event, and we would all very much like to be done with the site work before then, as we have other things that need to be done before the event, so it was suggested that the meeting this Wednesday be held at the site, so we can all hopefully finish up on the outhouses, and set the well pipe in place! All the parts we need should be there. And if you haven't registered for the event yet, do remember to do so! The best way is to use the online form at the bottom of our event copy here. The event officially opens on Friday, but remember, locals and volunteers get early access! We'll be camping out Thursday night; but we will probably set the tent up Wednesday. See you all at the Wednesday meeting!